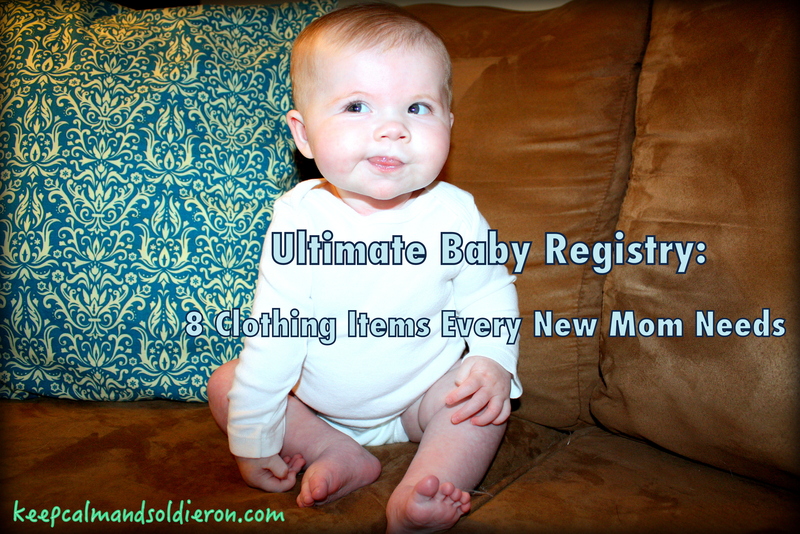 My tried and true clothing must-haves need to be on your new baby registry. Just click on photos and/or product names to find out where to purchase. FYI: I have not been compensated by any of the brands endorsed below. These are my own recommendations, baby-tested and mom-approved. 1. Gerber Unisex Newborn Side Snap Shirts – These shirts are the best for nighttime with a newborn. Just a shirt with a diaper makes middle of the night changes WAY easier. Register for a pack or two of these and you’ll be golden. 2. Carters White Onesies – The white onsie is so universal- it’s perfect for a bottom layer, it works with any bottoms and it’s adorable as a standalone outfit. I registered for these in every size (Newborn through 12 months- by the time they hit 18 months you won’t want to wrangle them into a onesie) in combos of sleeveless, short and long sleeves. Carters always fit our baby like a glove. 3. Carters Zip Up Sleep and Play – Zip ups are the best option- so much simpler than all the buttons and snaps. Jammies that zip from the ankle up are the very best. Get these in every size. Pro-tip: Newborn clothes with fold over sleeves are the best, so they can’t scratch their face. Fold over sleeves + zip up = holy grail. 4. Baby Mittens – Speaking of newborns scratching their faces…mittens are a great way to keep those sharp claws (which you will inevitably be too scared to clip) from shredding their precious skin. We have 5 pairs, because they end up in the laundry. Pro-tip: Register for a gender-specific color if you find out, so they match more of the clothes. 5. Trumpette Socks – Trumpettes seemed to always stay put on Maddie’s feet and they looked awesome to boot (tons of cool designs/patterns). No shoes necessary. Plus they’ve got grip on the bottom for when baby starts testing out her walking skills. Anywhere from 10-15 pairs of socks should be a good start. 6. Leg Warmers – Babies in leg warmers are the best — and they’re not just for girls! While they work under skirts and dresses, they also look super cute with the plain white onsie! I found that they were especially convenient when traveling- you didn’t have to undo an entire outfit to get to a diaper for a change. We got most of our leg warmers from Posh Pipsqueak on Etsy (they held up great to washing and drying), but BabyLegs also runs some great promos for stocking up. 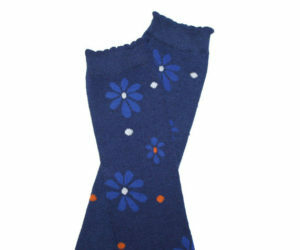 You can score five free pairs of BabyLegs leg warmers for your little one for just the cost of shipping using this unique coupon code: 66E8D0 (*offer only valid for the first ten people to use the code). 7. Carters Hooded Bunting – Babies in polar bear suits are also the best. Anytime I see a baby outside of a polar bear suit in the winter I think, “Why isn’t that baby in a polar bear suit?” Think about it. It makes sense. Plus, polar bears are plenty warm in the winter months, without being so bulky that I worry about car seat safety. 8. Baby Hangers – Plastic baby hangers are the way to go. Clothes slide on and off easily, without stretching out the neck of outfits. I hang up fancy outfits and onesies that I consider to be “outfits,” the rest I put into drawers. So I’d recommend registering for anywhere from 20-40 hangers, since you’ll likely receive a lot of clothing in a bunch of different sizes (aka a wardrobe) before baby arrives. Pro-tip: Sling matching diaper covers for outfits over the hanger so you don’t forget you’ve got them! I don’t know why I didn’t think of getting AB a polar bear suit. I’m so excited to put her in the little animal hats this winter (fingers crossed she tolerates them as well as she tolerates her bows), but that suit is 15,000x better than a hat. A polar bear suit with bows would be tops. I know for a fact they make a PINK polar bear suit (very rare in nature). This could so be Annabelle’s jam. I don’t have much to add to this except to say that I stole your ideas for the side-snap shirts and mittens and put them on my registry!